Last Sunday I got home from a weekend at Hot Lead, Canada's Finest Miniature Gaming Event (patent pending) in Stratford, Ontario. Unfortunately, the first thing I unpacked was a flu virus. I was immobilized for a week and now even typing leaves me wheezing. Hot Lead started off large with an opulent urban brawl in a 1924 Chinese port city. The GM, Patrick Mooney, based the scenario off of the Steve McQueen movie, "The Sand Pebbles". 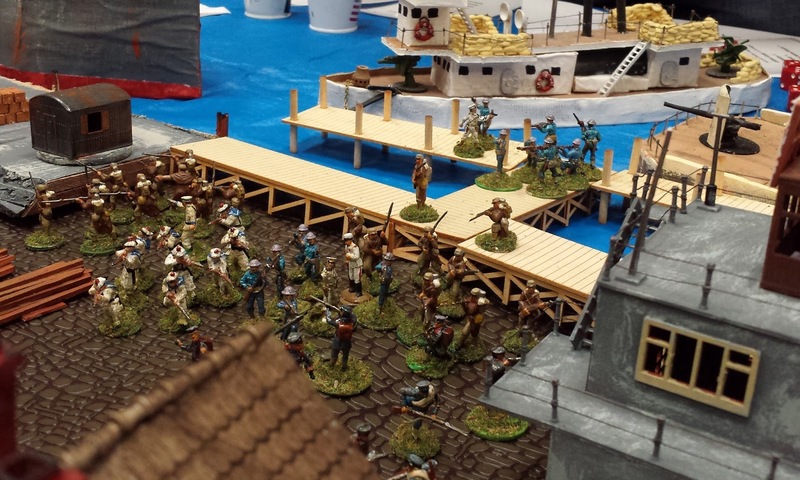 Striving to release hostages, French and American marines storm the docks and battle the local Tong warlords. What made this game so exceptional was the scenery, including huge, scratch built cargo ships; trilingual graffiti; and hand-painted Chinese banners. The whole effect was grandiose and cinematic. On Saturday morning, I played another pulp game, this one set in the 1960's in the Belgian Congo. Presented by veteran Game Master Dan Hutter, this game was also based on a movie: the ultraviolent "Dark of the Sun" starring Rod Taylor and Jim Brown. 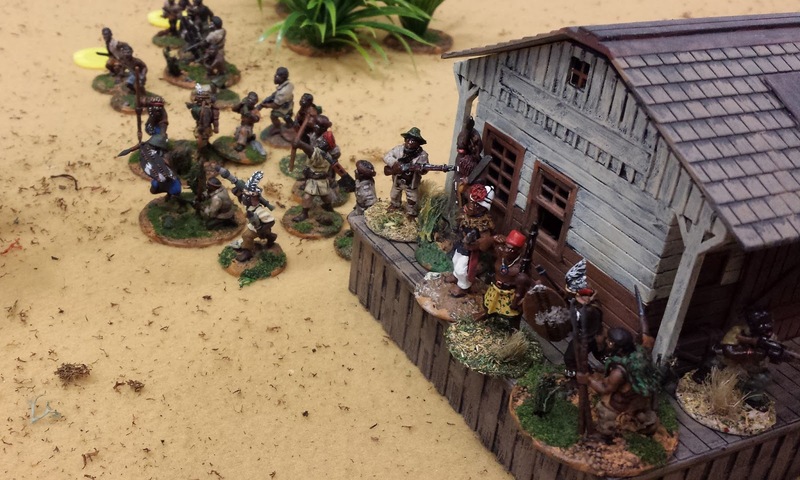 In this set up, Captain Curry (Taylor) must break into a vault and escape with a bag full of diamonds as hordes of African militias close in. Curry must then run to catch a slow moving train which will take him and his men to safety. I think this is the way to create a truly successful wargame scenario: steal your plot from the movies. This way, it comes with all sorts of action and drama baked right into the pie. And certainly Dark of the Sun was the most dramatic game I've played in years, with the excitement of running for the train, fighting from the train and finally busting through an improvised barricade. My final game of the weekend was Festung Kolberg -- a Bolt Action WWII game set in March 18th 1945. The Soviets have taken the port city of Kolberg. But a rear guard from the German 3rd Panzer Division is trying to keep them off the docks for long enough to allow for the rest of the German forces to escape by boat. 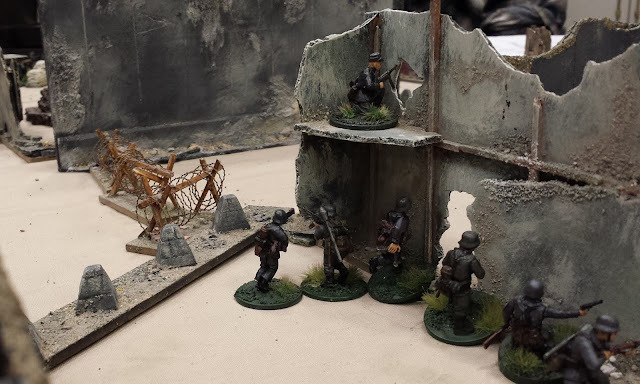 With his dreary, destroyed cityscape and well painted miniatures, the Game Master Ross Cossar really conjured up the sense of the Nazi's Götterdämmerung. A couple other games that I couldn't play really caught my eye, including this modern Afghanistan action, complete with beautifully rendered canals and orchards. This game was presented by Mr. Rabbits-in-my-Basement, who's responsible for putting all of Hot Lead together. And his website has some superb instructions on how to put this sort of table together. I fell in love with "The Battle for Dorkshire" presented by Mike Martin and Gary Schofield. 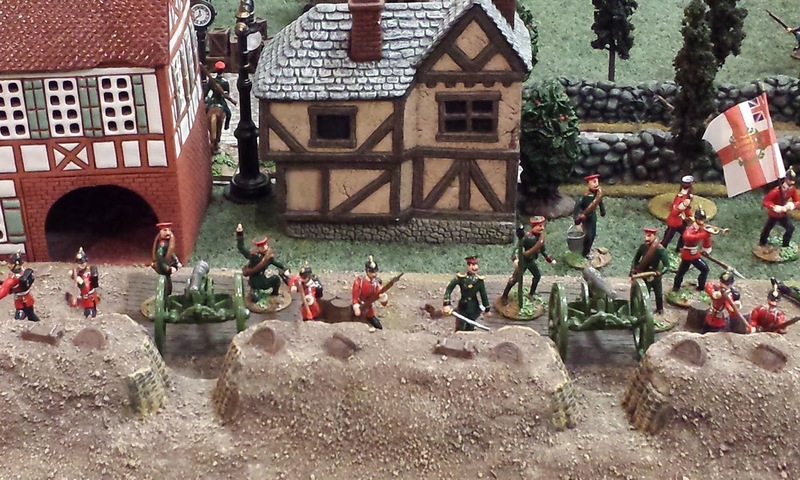 This was a battle right out of HG Wells, using home made, glossy painted 19th century 48mm bleisoldaten (solid lead German toy soldier) reproductions. I love how the houses look like they've been re-purposed from a Christmas store... it gives the whole table a dreamlike quality. 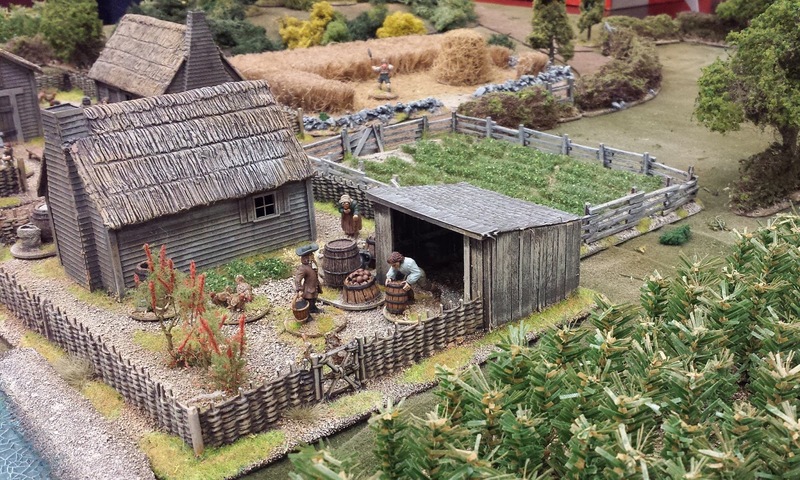 And finally, the most attractive game of the weekend was Graham Wilkinson's Westridge Farm set in Massachusetts, 1675. My opening picture of this post is from his game, as is the one below. 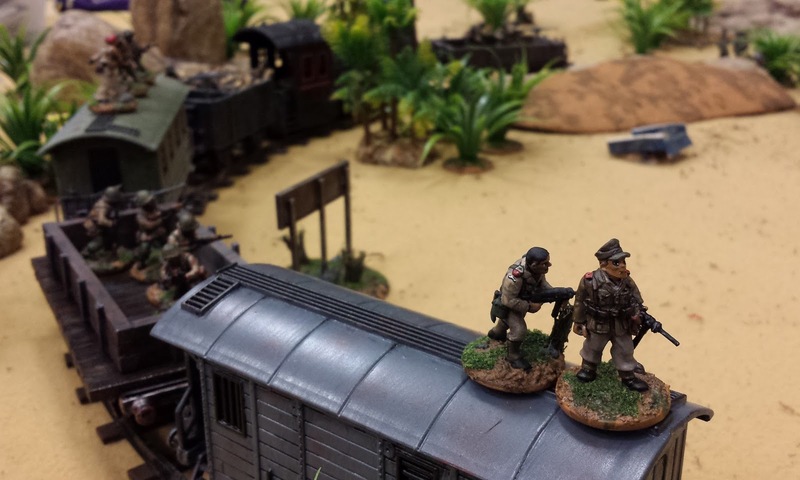 The lush, detailed and layered scenery made this game seem more like a museum diorama rather than a gaming table. 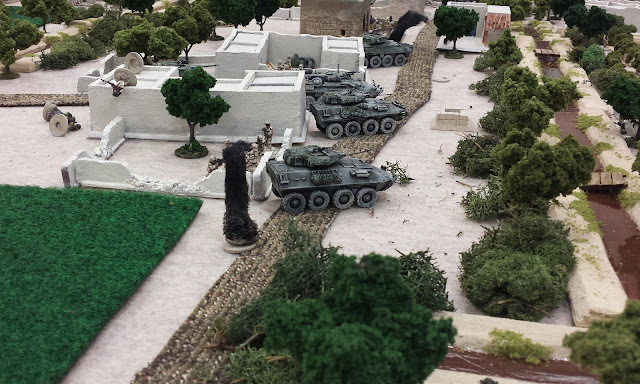 As I turn my mind this year to creating some of my own terrain, Graham's work will be front of mind. As always, a big thanks to Mr. Rabbit-in-my-Basement, Mrs. R-i-my-B, and the rest of the Hot Lead crew for putting on another great show. It is the highlight of my gaming year. Great report,thanks for sharing with us. Do the "battle for dorkshire" folk have a blog? I am interested to find out more about the figures and rules used. I thought of you, Tradgardmastare, when I saw the Dorkshire set up. It very much reminded me of your own work -- in fact, reading your blog is probably what attuned me to appreciating their set up. I don't know if they have a blog, but I'll ask James (who commented below) -- he may at least have an email address or something so that you can contact them. Mrs. Rabbitsinmybasement says "Awww...you're welcome." And she hopes you're feeling better! She too was struck down this past week. Someone mentioned a big jug of hand sanitiser... Might not be a bad idea! Sorry to hear that Mrs R. came down with something too. I'm not sure if you're checking up on these comments, James, but Tradgardmastare (who commented above) is looking for some more info about the fellas who put on the Dorkshire game. It seems they share an interest in those beautiful old handmade lead minis. Any idea if they have a blog or anything? Thanks Piotr! It was a great game. I'm sure Kolobrzeg looks a lot nicer now than it did in our battle. 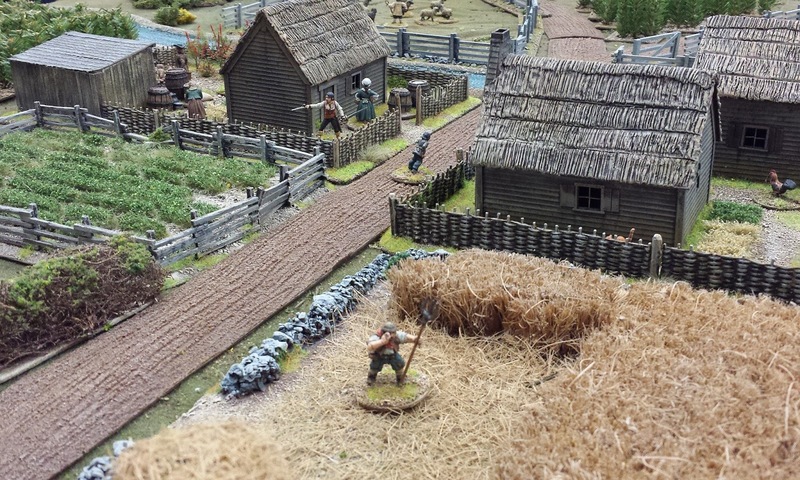 a great post some nice games on show the Westridge farm set up is outstanding. I know - I love that farm. Forgot to say hope you feel better soon. I'm clawing my way back to health - thanks TGM. Hmm, those are some really tasty pics!! Everything looks cool there! 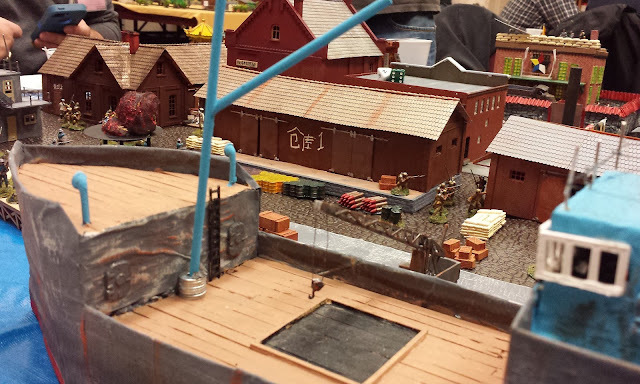 Thanks for the kind comments about my Westridge Farm game at Hotlead, I have to thank people like Herb Gundt of HGWalls and Pat of "Wargaming with Silver Whistle" for terrain ideas over the years.